Diamond Lake and the Trinity Alps, on the Four Lakes Loop. 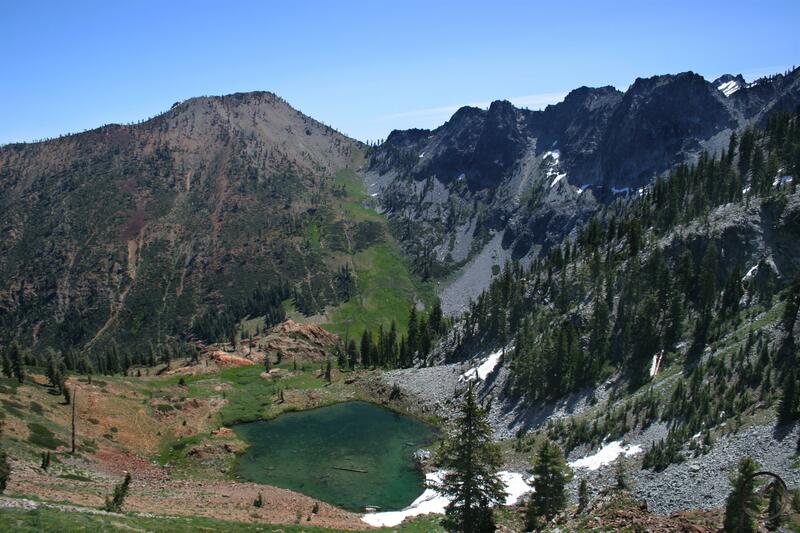 The Four Lakes Loop is one of the finest trails in the Trinity Alps, showing off its quartet of beautiful lakes with graceful confidence. Of course, the Four Lakes Loop is not the amazing trail it is only because of its lakes but also its perfect arrangement of stone and meadow, forest and cliff, peak and basin. It offers up all of these delights and then boasts some of the most magnificent views in Northern California. All of the features are arranged in ideal fashion as though the trail was designed to be a backcountry themed ride at an amusement park. Each turn of the trail reveals a new attraction, be it creek, canyon, peak, meadow, lake and cliff. All of the tremendous scenery of the Four Lakes Loop is had for surprisingly little effort. 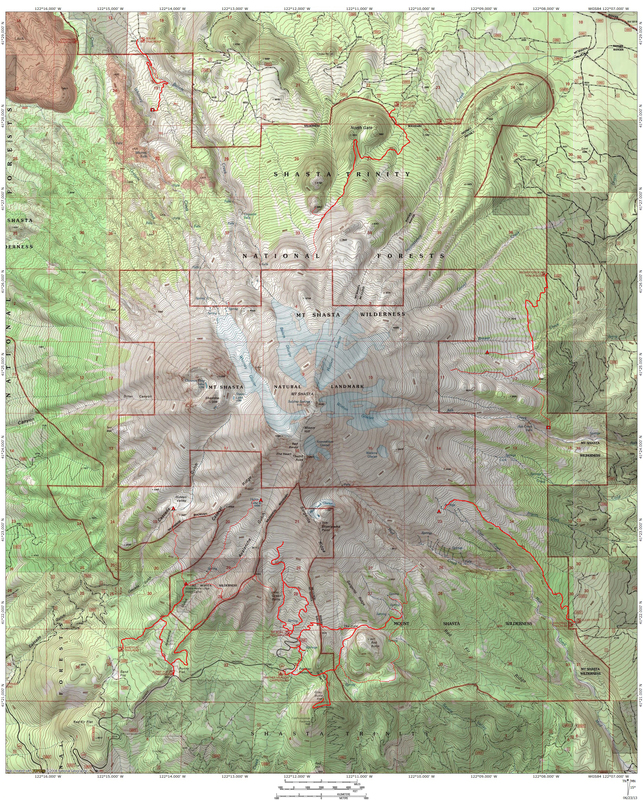 It is a roller coaster trail, climbing into and out of four lake basins slung on the flanks of granite Siligo Peak, but the grade is never steep and the effort is moderated by the constantly staggering vistas. Middle Peak, near Echo Lake on the Stoney Ridge Trail. 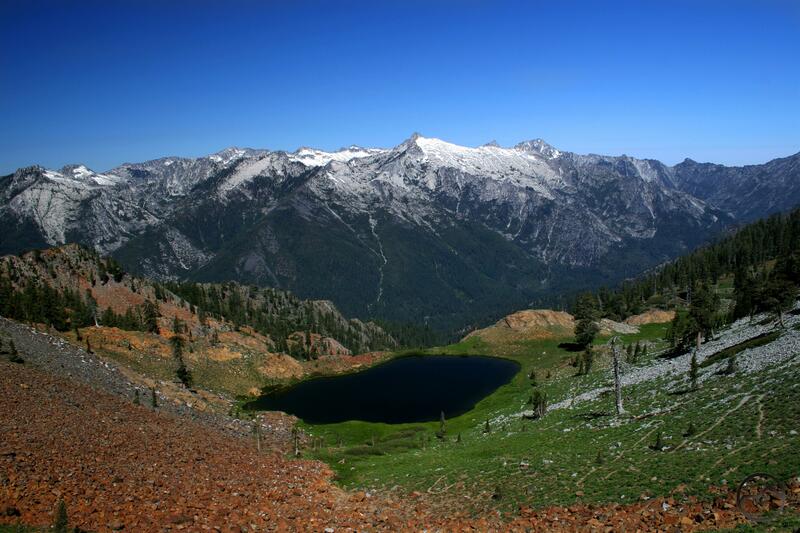 Unlike most of the trails in the Trinity Alps, the Four Lakes Loop is not accessible directly via a trailhead on the outskirts of the Trinity Alps Wilderness. Instead, it is necessary to backpack into the loop area and set up a basecamp. The distance from civilization is part of the Loop’s charm. It is accessed by four different trails, each of which connects to a number of other locations. Two trails, the Deer Creek Trail and the Granite Lake Trail are only useful if connecting the Loop to longer trips through the Trinity Alps. The Deer Creek Trail joins the Stuart Fork Trail so a trip to Emerald and Sapphire Lakes can also be joined to the Four Lakes Loop. The same can be said for the Granite Lake Trail, which forms a nice loop with the trail through Bear Basin. A steep series of switchbacks drop down into the Deer Creek Meadows where they link up to the lowest point on the Four Lakes Loop. Both of these trails are not very useful for reaching the Loop directly. To do that, it is necessary to hike the Long Canyon or Stoney Ridge Trails. Long Canyon is the shortest route and very scenic but it is steep and, as scenic as it is, it misses the numerous highlights through which the Stoney Ridge Trail passes. It is this last route that is the ideal route by which to access the Four Lakes Loop. Four Lakes Loop area from the Stoney Ridge Trail. The Stoney Ridge Trail is a case-study in delayed gratification. A long series of switchbacks tests the patience of backpackers as they climb through dense forest up toward Stonewall Pass. Beyond the pass they are rewarded for their efforts with alpine paradise. The trail passes through meadows, over creeks and passes wonderful Echo Lake, which makes a great basecamp from which to hike the Four Lakes Loop. As if the immediate surroundings were not beautiful enough, far-ranging views abound on the Stoney Ridge Trail. Once atop Stonewall Pass, every step of the trail brings new sights and vistas, all of which combine to make the ideal route to access the Four Lakes Loop. Red Mountain and Van Matre Meadow on the Stoney Ridge Trail. Afflicting hikers with 57 switchbacks at the outset of the trail should be enough to purge all but the dedicated from this stairway to alpine paradise. Staying under the forest canopy for much of the climb, the trial finally breaks out of the cover at Red Mountain Meadows, just prior to climbing Stonewall Pass. 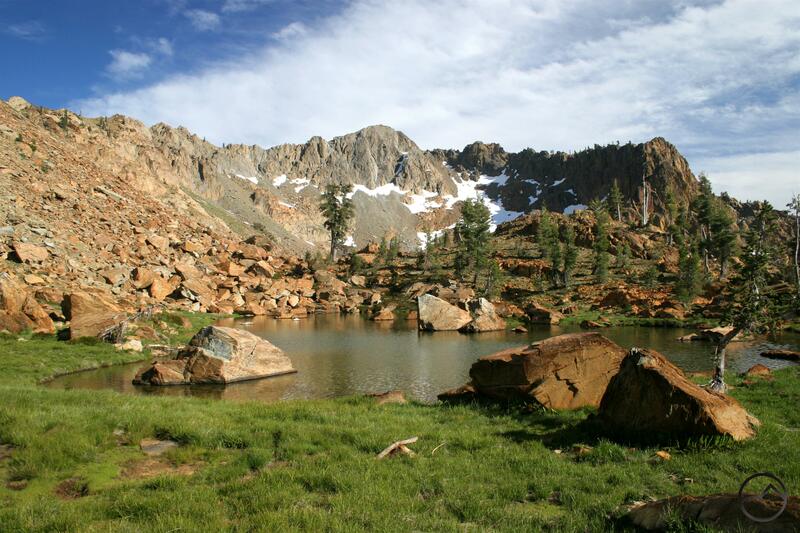 Beyond the pass, the route continues through lush Van Matre Meadows before climbing up to beautiful Echo Lake, which has both a spectacular rocky basin and an incredible view into the heart of the Trinity Alps. Beyond Echo Lake the trail surmounts Little Stonewall Pass and then drops down through peak-rimmed Siligo Meadows. One final climb above the meadow to Deer Creek Pass brings an end to the Stoney Ridge Trail and the beginning of the Four Lakes Loop. Luella Lake, Seven Up Peak and Dolomite Ridge. 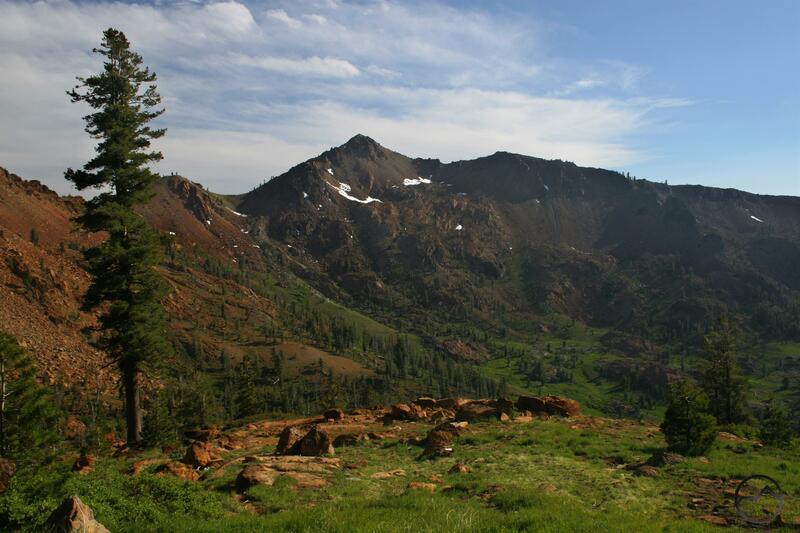 Starting at Deer Creek Pass, where the two typical access trails (Stoney Ridge and Long Canyon Trails) meet, the Loop traverses the upper portion of Deer Lake’s cirque. A short climb over a pass brings views of blue Summit Lake, the largest of the four lakes that surround Siligo Peak. There is also a short route leading to the summit of Siligo Peak and great views. A little further brings another set of switchbacks dropping down toward elegant Diamond Lake and one of the greatest views of the Trinity Alps, as the white towers of the Canyon Creek area loom beyond Diamond Lake and the canyon of the Stuart Fork of the Trinity River. Another climb up switchbacks yields views of delicate, azure Luella Lake. Beyond the lake, Seven Up Peak and Dolomite Ridge hover above the grassy expanse of Deer Creek Meadow. From the meadow the long climb up to Deer Lake and Deer Creek Pass begins but its difficulty is mitigated by tumultuous Deer Creek and the views of the granite giants on either side of the trail. Once back on Deer Creek Pass, the Loop is done, but the wonders of the Stoney Ridge Trail still await the return home. Its a lot, but the grade is pretty moderate and man, the scenery is more than worth it once you get past the switchbacks. It is awesome back there. These photographs are stunning! Kudos on your successful trip. I can’t wait to try it. Thanks much! Honestly, that trip was from a few years ago. 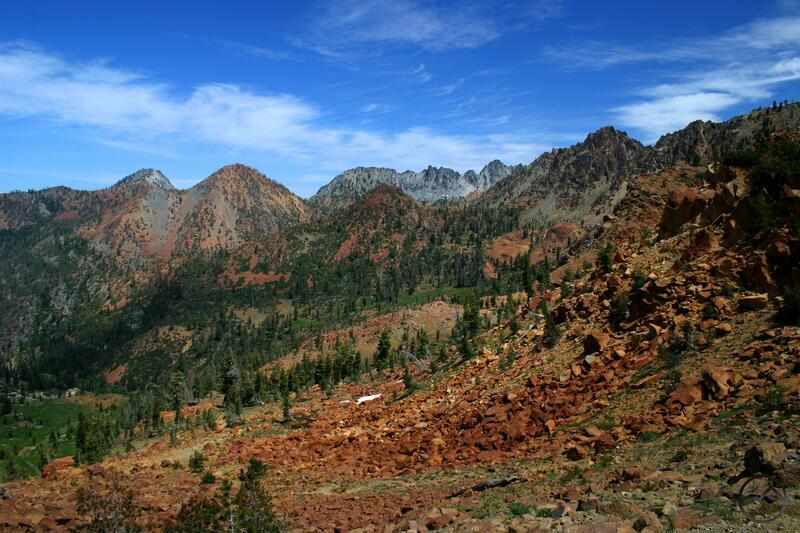 The Trinity Alps are so vast, I try not to double up on trails too much. Other than a day hike to the Bear Lakes a week ago, I have not even begun to hit the Trinities yet this summer. Not enough time and too much responsibility! I have gone up those twice. While in wilderness recovery center as a youth loved it love that place.